"Lord Maclean" redirects here. For the 1990–2005 Senator of the College of Justice (judge), see Ranald MacLean, Lord MacLean. Clan MacLean (/mækˈleɪn/ ( listen); Scottish Gaelic: Clann MhicIllEathain [ˈkʰl̪ˠãũn̪ˠ vĩçˈkʲiʎɛhɛn]) is a Highland Scottish clan. They are one of the oldest clans in the Highlands and owned large tracts of land in Argyll as well as the Inner Hebrides. Many early MacLeans became famous for their honour, strength and courage in battle. They were involved in clan skirmishes with the Mackinnons, Camerons, MacDonalds and Campbells, as well as all of the Jacobite risings. There are several different origins for the surname MacLean, however, the clan surname is an Anglicisation of the Scottish Gaelic MacGilleEathain. This was the patronymic form of the personal name meaning "servant of (Saint) John". Or the "son of the servant of Saint John. The family grew very powerful throughout the Hebrides and Highlands through allegiances with the Catholic Church in the 9th century, the MacDonalds in the 13th century, the MacKays and MacLeods in the 16th century. The founder of the clan was a Scottish warlord descended from the royal Cenél Loairn named Gillean of the Battle Axe . The stories of Gillean being descended from the FitzGerald dynasty are fictitious, as the FitzGeralds are of Cambro-Norman descent and the Macleans are of Gaelic descent, having been in Scotland since the Dalriadic migration from northeastern Ulster in the earlier centuries C.E. Gillean's great-grandfather was Old Dugald of Scone, born ca. 1050 during the reign of King Macbeth of the House of Moray, the principal royal line of the Cenél Loairn. He was a Judex (judge) and Councillor to King David of Scots. Gillean fought at the Battle of Largs in 1263 during the Scottish-Norwegian War where the Scottish were victorious. Gillean's son Malise mac Gilleain (from the Gaelic Maoliosa "Servant of Jesus") was thought by some to have taken the name Gillemor in 1263 and is also said to have led his followers at the Battle of Largs in 1263. He wrote his name as "Gillemor Mcilyn ("son of Gillean"), County of Perth" on the third Ragman Rolls of 1296, swearing fealty to Edward I of England. Gillean's great-great-grandson was Iain Dhu Maclean who settled on the Isle of Mull. One of his sons was Lachainn Lubanach (Lachlan) who was the progenitor of the Macleans of Duart and the other son was Eachainn Reafanach (Hector) who was the progenitor of the Clan Maclaine of Lochbuie. The Macleans of Duart married into the family of John of Islay, Lord of the Isles (chief of Clan Donald). By the end of the 15th century the Macleans owned the isles Mull, Tiree, Islay, Jura, Knapdale as well as Morvern in Argyll and Lochaber in mainland Scotland. The Clan MacLean are said to have fought in support of Robert the Bruce at the Battle of Bannockburn in 1314. During the 14th and 15th century many battles were fought between the Clan Maclean and Clan Mackinnon. In 1411 the Clan MacLean fought as Highlanders at the Battle of Harlaw near Inverurie in Aberdeenshire on 24 July 1411 against an Army of Scottish Lowlanders. Their enemy was the forces of the Duke of Albany and Earl of Mar. The MacLeans were led by "Red Hector of the Battles", the 6th Chief, who engaged in single combat with the chief of Clan Irvine, known as "Sir Alexander de Irwine". After a legendary struggle both died of the wounds inflicted upon each other. The Battle of Corpach took place in 1439. It was fought between the Clan Maclean and the Clan Cameron. In 1484 the Clan MacLean fought at the Battle of Bloody Bay on the side of the Lord of the Isles, chief of Clan Donald. In 1513 During the Anglo-Scottish Wars, Lachlan Maclean of Duart was killed at the Battle of Flodden. The clan extended its influence to other Hebridean islands such as Tiree and Islay and onto the mainland. In 1560 the Clan MacLean, joined by their allies the Clan Mackay and Clan MacLeod became part of the Gallowglass, who were ferocious mercenaries of Norse-Gaelic descent who served in Ireland for King Shane O'Neill. The rising power of the Clan Campbell during the sixteenth century brought them into opposition with the Macleans. Several marriages were arranged between Macleans and Campbells to avoid feuding, however one of these went badly wrong when chief Lachlan Maclean married Lady Elizabeth Campbell, daughter of the Earl of Argyll, chief of Clan Campbell. The match was not a happy one and Maclean took drastic action by marooning his wife on a rock in the sea, leaving her to drown. However she was rescued by some passing fishermen who took her back to her kin and Maclean was later killed by her brother in Edinburgh in 1523. The Battle of the Western Isles was fought in 1586, on the Isle of Jura, between the Clan MacDonald of Sleat and the Clan MacLean. In 1588 the Clan MacLean captured Mingarry Castle seat of the chief of the Clan MacDonald of Ardnamurchan, from where they fought off a Spanish galleon called the Florida. One thing that did unite the Macleans and the Campbells was their Protestant faith as well as their dislike for the MacDonalds. Sir Lachland Maclean harried the MacDonalds of Islay causing so much carnage that both he and the MacDonald chief were declared outlaws in 1594 by the Privy Council. However Lachlan redeemed himself when in the same year he fought for the king at the Battle of Glenlivet, on the side of the Earl of Argyll and Clan Campbell, against the Earl of Huntly and Clan Gordon. The Battle of Traigh Ghruinneart took place on the 5 August 1598. It was fought between the Clan Donald and Clan Maclean on the Isle of Islay. Chief Sir Lachlan Mor Maclean was killed. After Sir Lachlan MacLean's death in 1598, his sons took revenge on his suspected murderers, the MacDonalds, by carrying out a massacre of the people of Islay which lasted for three days. After obtaining "Letters of Fire and Sword" he was assisted in this by the MacLeods, MacNeils,and Camerons. The quarrel between the MacLeans and the Macdonalds of Islay and Kintyre was, at the outset, merely a dispute as to the right of occupancy of the crown lands called the Rinns of Islay, but it soon involved these tribes in a long and bloody feud, and eventually led to the near destruction of them both. The Macleans, who were in possession, claimed to hold the lands in dispute as tenants of the crown, but the privy council decided that Macdonald of Islay was really the crown tenant. On 3 September 1631 Sir Lachlan Maclean created a Baronet of Nova Scotia. Later during the Scottish Civil War he was devoted to Charles I of England and called out his clan to fight for James Graham, 1st Marquis of Montrose who was the king's captain general. The Clan Maclean fought as royalists at the Battle of Inverlochy (1645), Battle of Auldearn and Battle of Kilsyth, alongside men from Clan MacDonald, and other allies from Ireland raised by Alasdair MacColla. Their enemy was the Scottish Argyll government forces of Clan Campbell, led by Archibald Campbell, 1st Marquess of Argyll. Through cunning tactics the Royalist force of 1500 MacDonalds and MacLeans defeated the Argyll Campbell force of 3000. In 1647 the MacLean's Duart Castle was attacked and laid siege to by the Argyll government troops of Clan Campbell, but they were defeated and driven off by the royalist troops of Clan Maclean. The Battle of Inverkeithing took place in 1651 where Sir Hector Maclean, 18th chief was killed. Archibald Campbell the 9th Earl, son of the Marquess of Argyll, invaded the Clan Maclean lands on the Isle of Mull and garrisoned Duart Castle in 1678. The Campbells had control of Duart and most of the Maclean estates by 1679. When the Stuarts again called for support the Macleans hurried to their standard and Sir John Maclean, fifth Baronet fought at the Battle of Killiecrankie in 1689, in support of John Graham, 1st Viscount of Dundee. The Clan Maclean supported the Jacobite rising of 1715 and their chief, Sir Hector Maclean, was created Lord Maclean in the Jacobite peerage in 1716. However, the chief was exiled to France, where he founded, and was the first Grand Master of, the Grand Lodge of Freemasons in Paris. Hector returned for the Jacobite rising of 1745 but was captured and imprisoned in the Tower of London until 1747. He died in 1750 in Rome. During the rising of 1745 the clan had been led by Maclean of Drimmin who was killed at the Battle of Culloden. Duart Castle then fell into ruin. After the defeat of the Jacobites, the Macleans then served Great Britain with distinction. From that time onwards, all of the chiefs have been soldiers. Sir Fitzroy Maclean, the tenth Baronet, fought at the Battle of Sevastopol. Allan Maclean of Torloisk fought at the Battle of Culloden. He later commanded the 84th Regiment of Foot (Royal Highland Emigrants) in the Battle of Quebec. Allan McLane served in the American Revolution. Duart Castle on the Isle of Mull is the historic seat of the chiefs of the Clan Maclean. The castle is perched on a rock guarding the Sound of Mull. Dating from the thirteenth century it consists of a strong curtain wall as well as a substantial tower or keep that was added in about 1390. There are also later ranges that were built within the courtyard. Duart Castle was abandoned after the Jacobite rising of 1745 and it then became derelict and roofless. However, in 1911 it was acquired by Sir Fitzroy Maclean, 10th Baronet, chief of Clan Maclean who restored it. The castle is still owned by the Macleans of Duart although they now live in Perthshire. The castle is open to the public in the summer. The exterior of Duart Castle was used in the film "Entrapment" with Catherine Zeta-Jones and Sean Connery, whose mother, Euphemia McBain "Effie" — née McLean— was a Maclean. Ardgour House, near Corran, Ross and Cromarty was originally held by the MacDonalds but passed to the Macleans of Ardgour in the fifteenth century. This branch of the Clan Maclean were known as the Clan Tearlach. Ewan Maclean, 2nd of Ardgour was killed at the Battle of Bloody Bay in about 1482. They followed James Graham, 1st Marquess of Montrose, but Allen, the seventh lord was pardoned. The Ardgour Macleans did not take part in the Jacobite risings and now live at Salachan at Ardgour. Aros Castle on the Isle of Mull, Argyll was originally built by the Clan MacDougall, was then held by the Clan Donald, Lord of the Isles before passing to the Macleans after 1493. Aros Castle, Glengarrisdale, on the Isle of Jura, was held by the Macleans who came into possession of the north part of Jura. The southern part of Jura was originally held by the MacDonalds but by 1620 had passed to the Clan Campbell who complained that they were being harassed by the Macleans. This resulted in a battle in 1647 when the Campbells surprised the Macleans at Glen Garrisdale and killed many of them. There is a tradition that the severed head and two limb bones of one of the Macleans adorned a cairn near MacLean's Skull Cave. The castle was still in use when in 1690 the Campbell constable took action against the Macleans who had not taken the Oath of Allegiance to William of Orange. Breachacha Castle, on the Isle of Coll, was held by the MacDonalds, then the Clan MacNeil and then by the Macleans. In 1431 it was seized by Maclean of Coll, but they feuded with the Macleans of Duart, who in 1578 captured the castle. In 1679 Donald Maclean of Coll garrisoned it against the Clan Campbell chief, the Earl of Argyll. New Breachacha Castle was built nearby in 1750 and the old castle then became ruinous. Dr Johnston and Boswell visited the castle in 1773. In 1886 the old castle had passed to the Stewarts of Glenbuchie but it was bought by a descendant of the Macleans in 1965. Cairnburgh Castle, Treshnish Isles, Argyll, was originally held by the MacDougalls, then the MacDonalds and then by the Macleans of Duart. One story is that the chief Maclean of Duart imprisoned the chief of the Clan Maclaine of Lochbuie in the castle to prevent him producing an heir and that Maclanie's only female companion was an old, not overly pleasing woman, whom he made pregnant. Maclaine was murdered but the woman escaped giving birth to a son who recovered Lochbuie. In 1504 James IV of Scotland had the castle besieged when it was held by Lachlan Maclean. 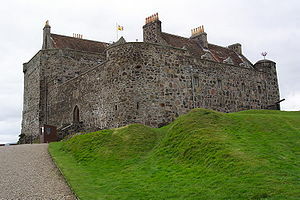 In 1647 the castle surrendered to the Covenanter General, David Leslie, 1st Lord Newark, and in the 1650s many of the books and records that had been rescued from Iona were destroyed in a siege by Oliver Cromwell's forces. The castle held out against attacks by the Campbells in 1679 but was surrendered in 1692. The castle was garrisoned during both the Jacobite rising of 1715 and 1745. Caisteal nan Con, (castle of dogs) near Lochaline, was held by the MacLeans of Duart and is said to have been used as a hunting lodge by those occupying Aros Castle. Caisteal nan Con, Isle of Torsa, originally held by the Campbells, then the MacDougalls and then the Macleans. It was probably also a hunting lodge. 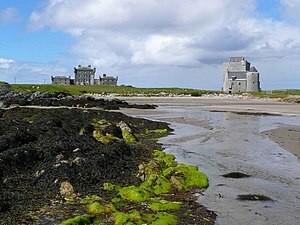 Castle Loch Heylipol, Isle of Tiree, was originally held by the MacDonalds and then by the Macleans, who were besieged in it by the Campbells in 1678-79. Castle Spioradain, near Inverness, site of a castle formerly on an island that was held by the Macleans of Dochgarroch in around 1420. The name means castle of spirits and the story goes that during a feud between the Macleans and the Clan Cameron, several Camerons were executed and their bodies were hung from the walls. The ghosts of the dead are said to have terrorised the castle and the area. The site was destroyed when the Caledonian Canal was built and human bones were found. Dochgarroch, near Inverness, site of a castle held from the sixteenth century by the Macleans who were known as the Clan Tearlach and who were allied to the Chattan Confederation. This clan of Macleans fought at as Jacobites at the Battle of Killiecrankie in 1689 and the Battle of Sheriffmuir in 1715. This line now live near Glen Urquhart and also near Edinburgh. Drimnin Castle, near Lochline, Highland, site of a castle held by the Macleans of Coll in the sixteenth century, but was demolished in the 1830s. Maclean of Drimin led the clan during the Jacobite rising of 1745 and he was killed at the Battle of Culloden. Dun Chonnuill Castle, on one of the Garvellachs, Argyll, is a ruinous castle that was originally held by the MacDougalls, then the MacDonalds and then by the Macleans who now live at Strachur House in Argyll and are hereditary keepers and captains of Dunconnel. Eilean Amalaig Castle, Isle of Mull, is where the Macleans of Duart marshaled their birlinns or galleys. Glensanda Castle, near Lochaline is a ruinous castle that was originally held by the MacMasters but passed to the Macleans in the fifteenth century. Gorm Castle or Loch Gorm Castle on the Isle of Islay was originally held by the MacDonalds and then briefly by the Macleans. The castle and island later passed to the Campbells and was still in use in 1745, but is now very ruinous. Kinlochaline Castle, near Lochaline, was originally held by the Clan MacInnes but passed to the Macleans after the MacInnes chief was murdured along with his sons by the Clan Mackinnon. Strachur Castle in Argyll was later replaced by Strachur House and is now occupied by the Macleans of Dunconnel, heredary keepers of Dun Chonnuill Castle. They were made Baronets in 1957. Tarbert Castle, Tarbert, Argyll and Bute, although a royal castle the lands were held by the Clan MacAlister and then by the Macleans. Torloisk House, on the Isle of Mull, Argyll was held by the Macleans of Torloisk. Sir Lachlan Hector Charles Maclean of Duart and Morvern Bt, CVO, Deputy Lieutenant of Argyll and Bute, 28th Clan Chief and 12th Baronet of Morvern. Septs are family names associated with a particular clan. Other family names associated with the clan include Auchaneson, Beath, Beaton, Black, Clanachan, Dowart, Dowie, Duart, Duie, Garvie, Gillan, Gillon, Gilzean, Hoey, Huie, Lane, Lean, Leitch, MacBeath, MacBeth, MacBheath, MacCormick, MacEachan, Macfadin, MacFadyen, Macfadzean, Macfergan, Macgeachan, MacGilvra, Macildowie, Macilduy, Macilvera, MacLergain, Maclergan, MacPhaiden, MacRankin, MacVeagh, MacVey, Paden, Patten, Rankin, and Rankine. Members of Clan Maclean show their allegiance to their clan and their chief by wearing a crest badge with bears the heraldic crest and heraldic motto of the clan chief. The blazon of the heraldic crest within a clan members crest badge is A tower embattled Argent. The heraldic motto upon the crest badge is VIRTUE MINE HONOUR. Long before crest badges were used by members of clans, it is said that plants were used as badges. These clan badges consisted of plants and were worn in bonnets in addition to being used as a banner and attached to a pole or spear. The clan badge attributed to Clan Maclean is Crowberry. There are two slogans attributed to Clan Maclean. Slogans, are sometimes said to be war cries, other times they are said to be rallying points for the clan. Slogans used by clans generally appear as a second motto within the chiefs arms. Slogans of Clan Maclean include: Bàs no Beatha (from Scottish Gaelic: "Death or life") and Fear eile airson Eachuinn (from Scottish Gaelic: "Another for Hector"). ^ a b c d e f g h i j k l m n o p q r s t u v w x y z aa ab ac ad ae af ag ah ai aj ak al am an ao ap aq ar as at au av aw ax ay az ba bb bc bd Coventry, Martin. (2008). Castles of the Clans: The Strongholds and Seats of 750 Scottish Families and Clans. pp. 386–388. ISBN 978-1-899874-36-1. ^ "McLean Name Meaning and History". Ancestry.com (ancestry.com). Retrieved 28 June 2008. ^ a b c d e f g h i j k l m n o p q r s t u v w x y z aa ab ac ad ae af Way, George and Squire, Romily. (1994). Collins Scottish Clan & Family Encyclopedia. (Foreword by The Rt Hon. The Earl of Elgin KT, Convenor, The Standing Council of Scottish Chiefs). pp. 238–239. ^ Gillean na Tuaighe in Scottish Gaelic and it is pronounced Gillane not Gill-ee-un. ^ a b c d e f g h i j k l m n o Clan Gillean (The Macleans), Edited by James Noel Mackenzie Maclean. F.S.A (Scot), F.R.Econ.S. Foreword by Fitzroy Maclean C.B.E, M.P. Published by the Clan Maclean Association, London and District Branch. ^ Battle of Bannockburn britishbattles.com. Retrieved 26 October 2013. ^ The Battle of Corpach clan-cameron.org. Retrieved May 25, 2015. ^ a b ’Conflicts of the Clans’ published in 1764 by the Foulis press, written from a manuscript wrote in the reign of James VI of Scotland. ^ "Conflicts of the Clans: Troubles in the Western Isles in the Year 1586". Electric Scotland. Retrieved 26 March 2009. ^ "Thomas Sean Connery". geni.com/(genealogy website). ^ Way of Plean; Squire (2000), p. 212. ^ Adam; Innes of Learney (1970), pp. 541–543. ^ Adam; Innes of Learney (1970), pp. 545–546. In the battle of Inverkeithing, between the Royalists and Oliver Cromwell's troops, five hundred of the followers of the Laird of M'Lean were left dead on the field. In the heat of the conflict, seven brothers of the clan sacrificed their lives in defence of their leader, Sir Hector Maclean. Being hard pressed by the enemy, he was supported and covered from their attacks by these intrepid men; and as one brother fell, another came up in succession to cover him, crying "Another for Hector." This phrase has continued ever since as a proverb or watch-word when a man encounters any sudden danger that requires instant succour. Innes of Learney, Thomas (1971). The Tartans of the Clans and Families of Scotland (8th Edition (1975 reprint) ed.). Edinburgh: Johnston and Bacon Publishers. ISBN 0717945014. OCLC 286413. This page was last edited on 17 March 2019, at 22:04 (UTC).